Those of you who know me well, know I am not fond of the kitchen. I like to eat (although lately, not so much), but my tastes are rather simple. Therefore, I am not sure I would feel at home in a high class French restaurant. So what was it that drew me to a book like The Hundred-Foot Journey, a novel about a young Indian boy who pursues his dream of becoming a famous French chef? It certainly wasn't the elaborate descriptions of food and slaving over a hot stove. I do, however, enjoy an inspiring story about reaching for one's dreams. And I like going behind the scenes in worlds or lives I am not familiar with, including getting a look inside the workings of a restaurant. 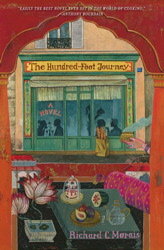 The Hundred-Foot Journey is not a deep novel, nor is it one I would label as a light read. Hassan Haji retells his life story, about his beginnings in the family kitchen in India to his eventual training in a haute cuisine French restaurant in Lumiére, just one hundred feet away from his family's own Indian restaurant and then onto strike it on his own in Paris. His family is forced to flee India after a tragic event that destroys everything his family worked. The family's relocation to France is met with some resistance, as is their attempt to establish themselves in the restaurant business there. There was a distance in the telling of the story, and it made getting to truly know Hassan difficult on some level. However, from what I did learn about him and his life, I liked and admired him. He has a natural talent for cooking and even his chief rival cannot deny it. Overall, it was an enjoyable book on one hand, but lacking on the other. I really would like to have gotten to know Hassan more. But there was a simplicity to the novel that was quite appealing. I enjoyed reading the behind the scene descriptions of shopping in the market for the freshest foods, the search for the perfect venue, spending time with Hassan's family, and seeing Hassan go from a young boy still trying to find his way to reaching his dreams. For more information about the author and his book, visit his website. Source: Copy of book provided by publicist/publisher. I am assuming this is a true story? I love food and I love stories about people who achieve their dreams in this area, but with any memoir, I really want to get to know the person and what makes them tick. Too bad this one lacks in that area. I like the cover and the premise, but it does sound as if something is missing. My tastes are much simpler and less highly developed than those of a gourmet, so the French cooking would be a mystery and education in itself. Though it sounds fairly simple, I think I would really love this book, as I am all about foodie literature. I think it sounds great and I will be keeping my eye out for it. I am sorry it didn't totally satisfy you though. You did end up writing a great review on it!! I just find myself drawn to stories about real people and food!! This is one that I already have on my TBR list. Glad to know that you enjoyed it! Nice review Wendy. That was my biggest problem with the novel - that I just didn't get to know Hassan as much as I would have liked to but ultimately I still enjoyed the book. As a die-hard foodie, I think I would love this book. On the other hand, it's nice to know about the distance issue. I like getting to know the people in my foodie books, so a heads up is definitely needed here. I just won this,so I'm sorry to see there's some distance in the telling, but I'm still interested because of the food aspect. I also won a copy of this from Dar's blog. I wish you had liked it better. I was hoping for more. I'm still planning to read it. Should be interesting to see how I feel about it. My cousin is a chef, which is why I was interested in it. That is a gorgeous book cover! I had to go back through your review to make sure it was a novel because for some reason this does sound like it would be non-fiction. Will have to put this one on my list. I'm not really that fond of cooking either, but for some reason I'm drawn to books like this, where cooking and restaurants are a big part of the story. I'm not really at home in kitchen either unless it comes to baking but I love foodie books for some reason. Sandy - It's actually fiction. It reads somewhat like a nonfiction story, however. From what the author said, he's hoping the book will eventually be made into a movie. Jenclair - I was really drawn to the cover and premise too. It definitely was interesting stepping into Hassan's world for a little while. Zibilee - Thank you! I admit that I'm not a big fan of foodie literature overall, but I've read a few that probably fall into that category which I ended up really liking. Staci - I hope you enjoy it when you get to it, Staci! Darlene - You too, eh? It really is too bad because I really would like to have gotten to know Hassan more. Andi - As someone who likes strong characterization in her books, it does hurt when a book doesn't come through in that regard. At least it had other things going for it. That's something, at least. Wisteria - I'll be really interested to read your thoughts on this one when you get to it, Donna. Iliana - It does sound like it could be nonfiction, doesn't it? It's definitely fiction though. Jill - It's funny how that works sometimes, isn't it? Diane - I hope you will enjoy it, Diane! I know what you mean about being overwhelmed by books . . .
Stacy - I hope you will like it if you do read it, Stacy! Weekly Geeks: Who Do You Connect With?